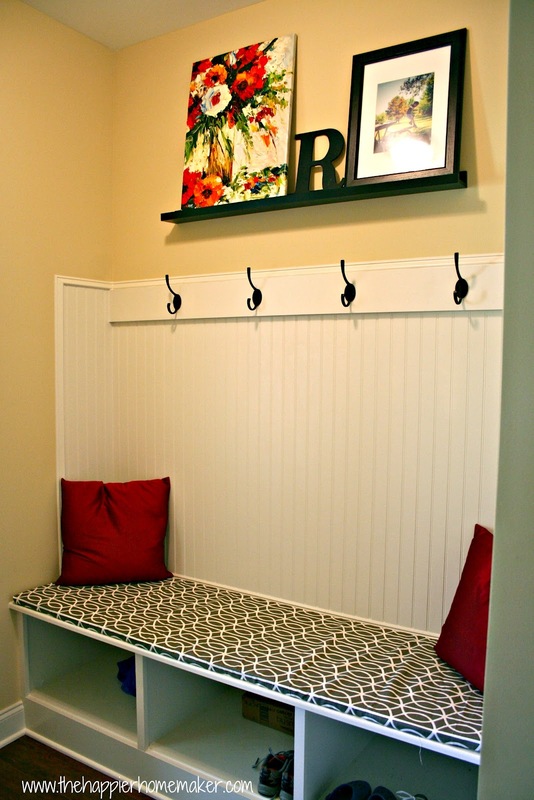 One of the four hundred projects I’ve been needing to do since we moved in is make a bench cushion for the mud room. I had no idea how expensive cushions were until I started trying to plan this project. Not just the cushion itself but even the foam is crazy expensive and none of the stores around me had it in stock where I could use a coupon. So, as is my style, I just kept putting it off…I really didn’t want to spend $70 to make a cushion let alone have one made due to needing a custom size. Then lo and behold the other day I was in Walmart and saw a roll of foam that was exactly the length I needed for my cushion! The only caveat was that it was only 1″ thick but because it is in a low use area and really more for decor I decided that wasn’t an issue, and the best part was the price-$16! I had bought a remnant of Dwell Studio fabric from my favorite pillow shop on Etsy and I thought it would work well for the space-dark enough to disguise any dirt from little boys! At first I had gotten out my sewing machine to sew the cover but, you know me-I had to try the glue gun first! (I have no idea what my problem is lately by the way-I have just NOT wanted to sew anything!) I trimmed the foam to the size I wanted and laid it on the fabric then carefully folded it, sealing with the hot glue as I went along. I am in love with the way it turned out. The red pillows I just threw there for effect when I was taking pictures, I’m thinking I need a different color…any suggestions? Thanks for stopping by! Be sure to follow me on Facebook, Pinterest, and sign up for my RSS feed so you don’t miss the fun! Was trolling the internet for church pew cushions – which you can only buy, it turns out, in tens of yards at a time. Found your site and took your cue by re-using a cushion from a window seat. Haven’t even glued it yet – just used packing tape to hold down the edges. Oh good, I’m so glad it helped Nancy-it was definitely the most cost effective option I found! Making a few seat cushions for a theater project and this would save so much time. Only thing is-I can’t find a roll of foam like this-any chance you remember the brand?? I’m sorry I don’t Cristina, it was in my Walmart fabric section on the bottom shelf if that helps at all! I had couple of questions about how you did this. On some DIY pages, there were suggestions of using plywood cut to the size of the bench. It doesn’t seem like you did this and I don’t see any need to, but I don’t do much in the way of home improvement projects. 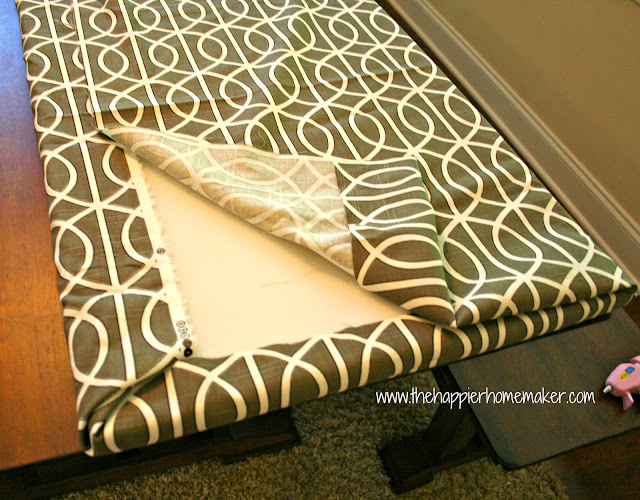 When you wrapped the material, had you pre-ironed creases where the edges would be? My bench is 45 inches long and 17 inches deep. I think this means that if I buy fabric that is 54 inches wide, i would need about a yard and a half. Does that sound right?